In 1977 I purchased from a local nursery which was closing forty R. yakushimanum hybrids, 20 cm tall in pots at what seems now a ridiculous price of 40p each. These remained in pots until we moved to our present garden at Radlett in Hertfordshire in 1982 when they were planted out. Among this collection were a group named the "Seven Dwarfs", created by Percy Wiseman, the well-known hybridizer at Waterers Nursery. In the ensuing years, these plants have grown considerably and are not so dwarf anymore! The following descriptions are of interest to those starting a rhododendron collection in their garden. Registered 1971. R. yakushimanum x 'Doncaster'. Pale pink with a brown blotch. A very hardy plant, needs little attention and goes a long time without watering. Now measures 1.6 meter in height by 2.5 meter width. Registered 1972. Half yakushimanum and half unknown. Pink. Awarded the HC in 1978. This is a fine plant with magnificent blooms and superb compact habit. One of my favorites, blooming in late May. Now measures 1.5 meter in height by 2.3 meter width. Registered 1971. Only a quarter yakushimanum with much other blood in its veins; facetum, dichroanthum and griersonianum. From its appearance one would think it had no yakushimanum in it at all. A deep rich red. Award of Merit 1977, FCC 1979. A favorite at Glendoick, I have read. While this is a fine plant, it suffers badly from mildew here in the South East in our long dry summers. Now measures 1.5 meter in height by 2.5 meter width. Half yakushimanum, half unknown. Award of Merit 1979. Peach fading to cream. This is the only true semi-dwarf plant of the group suitable for a rockery or border. It is prone to bark split caused by the late frosts after periods of warm weather here in Hertfordshire. It has fine foliage with brown indumentum, and has a superb hummock-shape with the excellent tight round yakushaimanum-type truss. Only two of the original four have survived. These now measure 1.0 meter in height by 2.5 meter width. Registered 1972. Half yakushimanum and quarter 'Doncaster' and quarter unknown. Award of Merit 1977. The name 'Hoppy' was used rather than 'Happy' as Rothschild registered a rhododendron of this name in 1940. This is also one of my favorite in flower opening pale lavender, fading to pure white. A wonderful sight in a woodland setting. This is "The Giant" dwarf which, in time, will grow into a plant of some size. Now measure 2.5 meter in height by 3 meter width. Registered 1971. Half yakushimanum, quarter unknown, quarter 'Doncaster'. Pale mauve, spotted brown. This is the runt of the litter which I found very difficult to grow. Despite all my efforts, the leaves always showed signs of cholorsis, and the plants lacked any vitality and slowly died one by one probably due to our very dry summers. One plant, which I gave to a friend locally, survived but in a stunted, miserable condition. I have not seen this plant for sale in the nursery trade for some years which I think speaks for itself. Registered 1971. Half yakushimanum, quarter unknown, quarter 'Doncaster'. This is an easy vigorous plant which layers very readily, with good dark green foliage but is not to my taste as it is a rather garish red/pink which fades badly in sunlight and does not sit easily with the surrounding plants in my collection. If you do try it, I suggest placing it amongst white flowering varieties. Now measures 1.7 meter in height by 2.8 meter width. Amongst the others in the original collection were: 'Venetian Chimes', 'Percy Wiseman', 'Golden Torch', and 'Chelsea Seventy'. The first three have proved to be excellent garden plants, very hardy, keeping their semi-miniature stature. They are beautifully compact in habit, and will fit in every well with smaller garden schemes. 'Chelsea Seventy' while having a startling flower with strong dichroanthum influence has a leggy habit with not particularly inspiring foliage. 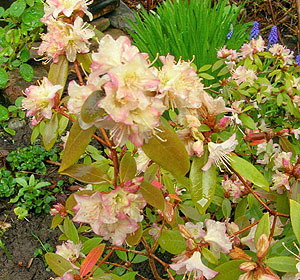 Looking for a rhododendron with black-looking flowers? 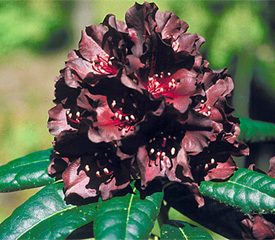 Rhododendron 'Black Widow' is causing quite a stir among collectors as its very dark maroon flowers appear to be almost black. Also, to add even more interest, this interesting hybrid has white stamens which stand out against the black, wavy-edged petals. Up to 21 flowers are held in ball-shaped flower trusses. Bloom-time is typically May in North America. The plant's bright green foliage is 6.5" long, elliptic in shape, ribbed and shiny on top. It has an upright and spreading growth habit, and it grows to a typical height of 3 feet in 10 years. The plant is cold hardy to at least -5°F (-21°C). 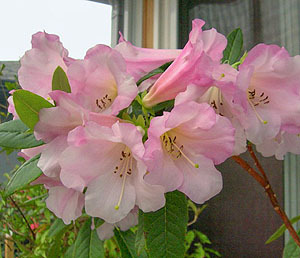 Consider having this wonderful rhododendron cultivar in your garden. Two of my favourite rhododendrons were named after two ladies - Mary Fleming and the Countess of Haddington. I have no idea what the namesakes of these varieties were like in life, but if I had to guess about them based on the plants bearing their names, then they both must have been lovely ladies, but altogether different. I picture Mary Fleming as having been a dainty, petite lady who had a spine of steel. She must have been very pretty too. Rhododendron 'Mary Fleming' is such a good "do-er" in the garden. My own plant is in a fairly tough spot that gets full sun for most of the day and is often very dry in the summer. However, Mary Fleming grows well there and rewards me with lots of small pinky-yellow flowers every March. For me, it's one of my most reliable early bloomers and the flowers last through light frosts. The plant is attractive throughout the year with small leaves that often take on a reddish hue in the winter. It stays fairly small - about 2' in ten years, and that's about the height of mine, but I have seen older plants reach about 5'. It's a hybrid of two lovely species, racemosum and keiski. While my plant is in the ground, Mary Fleming also makes a good potted plant due to its small stature. The Countess of Haddington is an old variety, (1862), so presumably, was named after the real Countess of the day. It was a cross of ciliatum by dalhousiae. For those lucky enough to garden in warmer climates than mine, I suspect you can manage this one easily out of doors, but here in the Pacific Northwest, the Countess requires effort. I guess that since she's an aristocrat, she expects special treatment. I grow my 'Countess of Haddington' in a 5 gallon pot. During the summer months she lazes around under the shade of an old apple tree where she gets some protection from the heat of the day and from full sun. I use a slow-release fertilizer treatment three times a year, and the Countess gets lots of water as the pot dries out quickly. I may have to break down and re-pot this plant this summer, but if I do, it will go into as light weight a pot as I can find because I do move the pot around frequently in winter. I occasionally pinch back some of the new shoots to keep the plant a manageable size and maintain some fullness. However, even after 6 years, the plant is a very manageable 4' tall, presumably due to its ciliatum heritage. Since the Countess of Haddington is tender here, as soon as the temperature drops to near freezing, the plant gets moved to a sheltered area near the house where it spends much of the winter. I like to leave my tender rhodies outside as much as possible in the winter, but I pay close attention to temperature forecasts and my secret to growing them is to be ready to move pots into a frost-free area whenever necessary. The Countess of Haddington is only hardy to about 20°F, so I'm prepared to pop it and all my other tender rhodies under my enclosed deck anytime the weather forecast indicates the temperature may drop to more than just a few degrees of frost. There aren't any windows under the deck so the plants remain in the dark during cold weather. During cold weather snaps, I have left them in this location for up to three weeks at a time, but they manage just fine even though there's no light. Once the cold is past though, they get moved back outside to their sheltered spot. I take care to make sure The Countess and her friends are watered on an as needed basis throughout the winter. It is surprising how fast they can dry out, even if it's pouring rain. As soon as I see the flower buds opening, usually mid to late February, the Countess is moved into my sunroom where I'm rewarded with large, trumpet-like flowers of very pale pink. The fragrance is also wonderful and the plant perfumes the entire house. Since the sunroom is fairly cool, the plant stays in flower for almost a month which makes my efforts worthwhile. So, while Mary Fleming is a tough plant and the Countess of Haddington is a tender aristocrat, they're both lovely ladies, and I enjoy their company. Many of us are downsizing our gardens and growing smaller Rhododendrons allow us to indulge our passion for our favourite genus. There are lots of small rhodies to choose from, but if you’re looking for good reds, then three small reds come to mind that fit the bill of small plants with good foliage. If you’re interested in species, then R. forrestii ssp forrestii 'Repens' is a lovely plant to grow. It really is a ground cover, not growing over about 18 inches in height, if that. I've been growing this species as a "companion plant" in a couple of large containers. While I've had the plants for 5 or 6 years, my R. forrestii hasn't bloomed much (I think it is a shy bloomer anyway), but I don't really care. The occasional red flowers are handsome and I enjoy seeing them, but it's the foliage I like as the plants have good, shiny green leaves that make a lovely, well-behaved ground cover in my large pots. I have the 'Repens' form, but there are a number of selected forms available. R. forrestii ssp forrestii is one of the parents of both 'Baden Baden' and 'Carmen', two nice small hybrids, both of which have been around for many years. 'Baden Baden' is a Hobbie hybrid ('Essex Scarlet' x R. forrestii), and 'Carmen' is a Rothschild hybrid of R. sanguineum ssp didymum x R. forrestii. 'Baden Baden' has bright red flowers, about 2 inches across, with a slightly darker eye. Flowers are borne in clusters of 3 to 5. When in bloom, the flowers make a nice contrast with the emerald green foliage. It's fully hardy here in the Pacific Northwest where it blooms in mid to late April. Plant height is 2 to 3 feet after 10 years, so it's a good choice for either a small garden or to grow as a container plant. 'Carmen' has deeper red flowers, more maroon red than scarlet. It is considered a true dwarf hybrid, reaching just 18 to 24 inches after 10 years. The leaves are rounded and the plant forms a nice mounded growing habit. I've been growing 'Carmen' in a container plant for a few years now, and it blooms reliably for me in late April to early May. It's a great plant to enter in flower shows because people just fall in love with it when it's in bloom. The flowers are small and bell-shaped. All three of these plants are reasonably easy to find and easy to grow, both in conventional shrub borders or in containers, so, if you're looking for small, red-flowered rhododendrons, consider growing these three - they're all good 'do-ers'. I first saw Rhododendron 'Alison Johnstone' in a garden in the Oakland California area on a tour organized by the local chapter hosting the ARS conference. I can't remember the year, but I think it was in the late 80's or early 90's. I simply fell in love with "Alison" and started a hunt for a plant upon my return home. I was lucky enough to find one, but at the time, I was living in an apartment so I had to grow it in a container on the balcony. Some 20 plus years, and three moves later, it is still in a container, albeit a much larger one (a 90 liter pot) than when I started. "Alison" blooms reliably every spring, and it's the flower colour that continues to attract me as it is such a curious colour. The flowers are not a true pink, but have almost an amber undertone which makes the colour hard to describe. I don't know of any other rhododendron that has quite the same flower colour. In addition, the foliage has a definite bluish cast which provides interesting foliage throughout the year. Since my original plant is so big, I find the thought of trying to plant it in the ground too daunting, so this plant will spend its entire life in a container. Using a slow-release fertilizer, I fertilize at least twice a year: early April and again in late June and the plant gets lots and lots of water. Other than deadheading and maybe a bit of judicious pruning, this is all the care this big plant gets, but it seems happy and puts on new growth and flowers well each year. Others have told me that their 'Alison Johnstone' plants occasionally suffer from mildew, but I haven't found this to be a problem. However, I have a windy garden so my plant gets lots of air flow. I now have a second plant (won it in a raffle at one of our club meetings this spring), and this plant will get planted in the ground this fall. Now, here's a curious problem I've never encountered before. I noticed earlier this week that there were suddenly dozens of healthy new leaves of my 'Alison Johnstone' lying on the ground around the plant. My other rhodies nearby were fine and I couldn't find any evidence of disease or insect pests that might be responsible. We haven't had any big wind storms recently, so that wouldn't have caused the problem either. I kept on going out and checking, and all I could find were yet more young leaves on the ground. Then, last evening, I noticed the leaves and branches were moving slightly, and sure enough, leaves fell off. I'm thinking, EEK, A RAT! - or something equally awful, but after watching for awhile, out popped a small wren. Since then, I've seen the wren flying in and out of the plant, and every time, more leaves appear on the ground. The bird doesn't appear to be eating anything, nor does it seem to be making a nest or using the leaves for anything. I know birds often break off small branches for nests, but this behaviour baffles me: I've never seen anything like it before, nor heard about this kind of behaviour. So if any of you bird watchers know why the wren is doing this, I'd love to hear the explanation. The only thing I can think of is that the wren shares my love of 'Alison Johnstone', but really, enough pruning already! To craft something "better" has always been man's aim. Horticulturalists have, throughout time, taken this to heart as the attempt to combine beauty and form, sculpting nature to create the previously impossible. 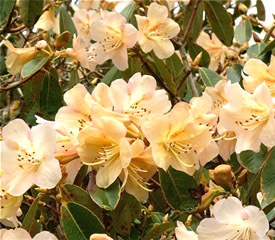 Around 1968, rhododendron hybridizers were faced with a challenge to not simply combine species, but to give life to something that had never before existed in nature: the golden rhododendron. "There was a breakthrough in yellows…" says Frank Fujioka to me as we sit in the warm light of his kitchen, sun setting on the beautiful view of Puget Sound out his bay windows. “…Everyone had to work for yellows, and we didn’t think much about what the plant looks like. Some…were really sprawled ugly things, but if you had yellow, wow! That was what was really important." Fujioka continues on to explain that the closer a rhododendron was to deep, pure daffodil yellow, the better. Many hybridizers simply combined white flowers with cream in hopes of drawing out the elusive shade, a system which Fujioka himself employed in the beginning days. "You get tired of getting poor results!" he confided in me, "so you think, there must be a better way". Thus, a more scientific approach was discussed. "You achieve your goals faster, I think, if you studied the genetics." You can't just combine this with that and hope for a miracle. "Sometimes you get pink!" Beyond the complicated genetic tracing, growing new varieties of rhododendrons is no easy task, and certainly not one for those interested in instant gratification. “It’s a long process,” said Fujioka about hybridizing. Often he spends up to six years growing a plant that is simply one more step in the direction of his end goal. More often than not however, he has a strategic plan. “Sometimes you’re thinking three generations ahead,” he tells me. This was certainly the case in his work towards the ground-breaking discovery of a golden rhododendron. For Fujioka, resounding success came after many years in the form of a stunning bloom called ‘Seaview Sunset’ who’s beautiful coloring seems to “glow” in certain lighting. The popularity of this hybrid, registered in 1988, has increased exponentially, and has become a favorite in the Northwest and beyond. Rhododendron 'Mary Fleming' is in full bloom now. This well-behaved plant is a nice addition to a border or small garden since it doesn't get very big, maybe 3 feet tall or so in 15 years. In addition to the plant itself being small, 'Mary Fleming' has small leaves, and like many small-leaved rhodies in my garden, R. 'Mary Fleming' can take full sun. The old adage is the smaller the leaf, the more sun a Rhododendron can tolerate. Having said that, however, I do like to plant my Rhododendrons in locations where they get some shade during the hottest part of the day during the summer. 'Mary Fleming' has pale yellow flowers tinged with pink and the combination blends well with other flowers. I looked up the parentage of this hybrid, and it's a cross between two nice lepidote species, R. racemosum and R. keiskei. What the breeder (Nearing) did was to cross these two species to create a plant that became one of the parents of R. 'Mary Fleming' and then he crossed this hybrid plant back to R. keiskei in what is called a backcross. Presumably, the pale yellow colour of R. 'Mary Fleming' comes from the keiskei genes while the soft pink comes from racemosum, as does the free flowering habit. The parent species are also nice plants for a small garden. I grow both, with R. keiskei in a container and R. racemosum in the ground. Neither of the parents is in bloom just yet, although flower bud colour is showing. With a little luck on timing, R. keiskei may be in bloom for an up-coming flower show and if it is, I will enter it into the show. Being small, it won't draw the "oohs and ahs" of some of the big-flowered Rhododendrons, but it's so sweet, it deserves being shown. I have a smallish garden, but want to grow every Rhododendron I can since there isn't one I actually dislike. To reconcile lack of space with my acquisitive nature, I grow lots of things in pots. Right now, Rhododendron 'Rose Elf' is in full bloom and it's such a sweetie. It's about 2 feet tall by 18 inches wide and the silly plant is literally covered in pale pinkish/lavender flowers. The advantage to having containers is that as plants come into peak bloom, I can move them into prime viewing areas on the patio and deck. So, right now, 'Rose Elf' is beside the front door getting admiring glances from all my neighbours. Fortunately, I have a safe neighbourhood, and I'm not worried about plant thieves. I was first introduced to 'Rose Elf' at a rock and alpine show - someone had entered it into the dwarf companion shrub class. Isn't it funny to think of Rhododendrons as companion plants? Rock gardeners like this variety because of its small scale and well-behaved growing habit. And locally, 'Rose Elf' tolerates full sun exposure. I've had my plant for about 15 years, and in that time, it's gone from a rooted cutting in a 4 inch pot to its current home in a 2 gallon container. Over the years, I've obviously potted it on, gradually moving up the pot size as the plant grew. I don't have an exact potting mix that I use every time, but typically, I mix well-crumbled peat moss, perlite and some fine bark mulch together as a starting point. Lately, I've been adding some Sea Soil (this is a commercial composted bark mulch and fish waste product), and then, if it's handy, I mix in some sharp, coarse sand and even some garden soil. I don't use exact measurements, but, more or less, I use equal parts by volume of the various ingredients. I'm after a potting mix that holds some moisture, has good aeration, is dense enough to hold the plant in place and is on the acid side. I don't worry about nutrients in the actual potting mix because I use slow-release fertilizers like Osmocote or Nutricote on a regular basis. I top-dress my containers with fine bark mulch or on occasion, with pretty agates from my beach combing trips. It looks nice, but more importantly, it helps prevent the soil mix from getting too compacted when I water or from heavy rain. The major issue for my pots is watering in the summer. There are times when I need to water on a daily basis, and that's o.k. with me, but to cut down on watering as much as possible, I move my pots to shady locations for the summer. They get tucked under my apple trees, lined up under the eaves on the north side of the garage and I have an old patio umbrella that I set up to shade some of the larger containers. It's amazing how the plants seem to thrive and just a bit of shade has cut my watering by about a third. When I want to be away, I hire my neighbour's son to come and water. I'll make a gardener out of that young man yet!